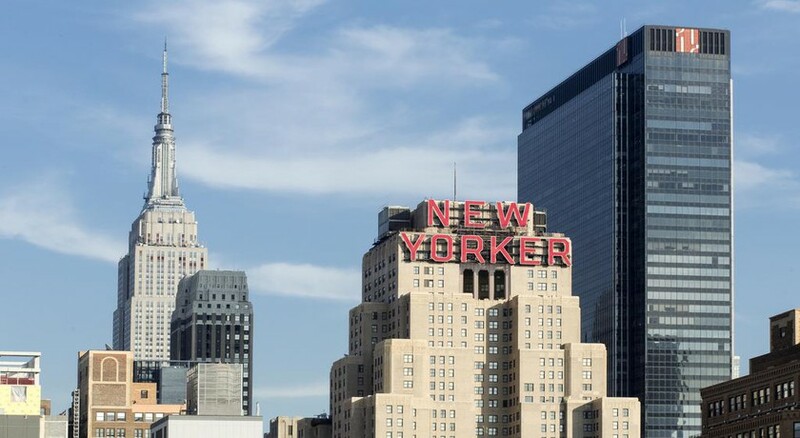 A New York landmark situated in the bustling Midtown West neighbourhood, The New Yorker, A Wyndham Hotel is the perfect address for visitors seeking a luxury stay right in the city centre. Boasting an Art Deco façade, elegant rooms overlooking the glittering NYC skyline, excellent location and a host of superb amenities, this 1929-built hotel has played host to illustrious guests like Nikola Tesla, John F. Kennedy, Muhammad Ali and Jennifer Hudson. The stylishly decorated rooms and suites redefine luxury and feature modern facilities such as flat screen TV, work space with chair, MP3 docking station and coffee maker – all that you need to enjoy a relaxing stay. If you want to explore the dining scene at this plush hotel, the 24-hour Tick Tock Diner is a New York institution, or you can indulge in hearty Italian food or sip your favourite cocktails at the bar. 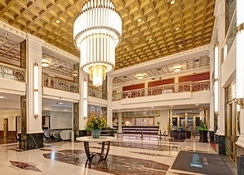 The hotel provides a number of venues for events, such as business meetings at the conference rooms, reception in the Grand Ballroom or a grand event at the 39th floor Sky Lounge that affords sweeping views of the Empire State Building, the Statue of Liberty and other New York landmarks. 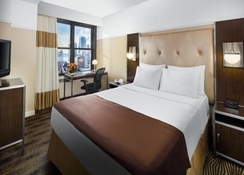 Nestled in Midtown Manhattan the Wyndham New Yorker Hotel enjoys a fabulous location attracting couples and families. It is just minutes from the Times Square, Empire State Building, Jacob Javits Center and one block from Penn Station, Madison Square Garden and Manhattan Center, which means you’re in proximity to the major attractions in NYC. Top-notch shopping, dining, legendary entertainment and architectural marvels are all within close proximity to the hotel. The hotel offers amazing views of the cityscape from its rooms and suites. The John F. Kennedy International Airport is around 21km from the hotel. 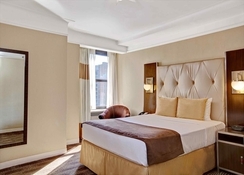 The rooms at the Wyndham New Yorker Hotel are luxurious, comfortable, antique, relaxing and contemporary. They are available in the following categories: Metro One Queen Bed, Metro One Double Beds, Accessible Metro One Queen Bed, Accessible Metro Suite Two Double Bed, Executive One Queen Bed, Executive Two Double Beds and Executive Suite Two Double Beds. All rooms are furnished with the necessary amenities including a flat screen TV, double bed, sofa set, table, chair, night lamps, air conditioning, heater and much more. The hotel’s three restaurants and bars do a great job of satisfying your appetite. You can start your day at the Tick Tock Diner with a mouth-watering breakfast and also have burgers and sandwiches at any point of time. In Butcher & Banker NYC, you can enjoy lip-smacking dinner, mocktails, cocktails and much more in a vibrant and cosy atmosphere on the other hand the Trattoria Bianca treats guests with Tuscany’s rustic and bold flavours in a lively setting. 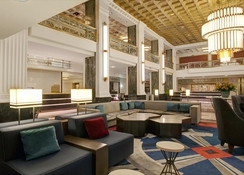 The Wyndham New Yorker Hotel offers sport and entertainment facilities in abundance to keep guests occupied throughout the day. Those who want to maintain their fitness level can take advantage of the fully-fledged fitness centre with expert trainers. The hotel also provides access to an amusement park, helicopter/airplane sightseeing, museum/gallery viewing, sightseeing tours and much more.